Geoff Scott custom frame builder of Gefsco and Clamont bikes, in Brisbane for Pushies Galore 2015. 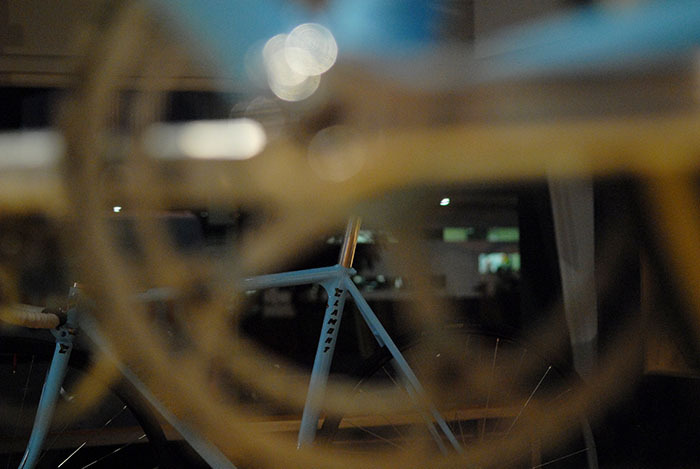 Geoff Scott builds custom bicycles from his workshop in Camden. His reputation for building Gefsco custom bikes lead to building Clamont bicycles. Geoff Scott’s reputation as a custom frame builder is as closely linked to the successes of Australian cycle sport, as the race wins of the riders who raced his bikes. Olympic and Commonwealth Games gold medals were won on Geoff’s bikes, some built in his shed at Camden New South Wales. When Geoff first started building custom bikes they were branded as Gefsco, later when Geoff began building for Tony Cook’s Clarence Street Cyclery, Geoff Scott custom bikes were re-branded as Clamont. When Pushies Galore 2015 arrived, Geoff and myself had a few days to relive the past and invent some new ideas for the future. It was about thirty years since I’d raced Geoff’s bikes, first his custom Gefsco road frames and then Clamont track bikes for the Clarence Street Cyclery Portuguese Cycling Club Team. We worked out that I’d helped Geoff in his frame building business when it was located out the back of Bob Hinse’s bike shop. The workshop of Geoff’s that I remember most vividly is the one he’s working from now, underneath his residence at Camden. Back in the 1980’s when the garage doors were flung open you’d find Geoff there, wearing his trademark white overalls, surrounded by frame building paraphernalia, a fridge full of beer and Harley Davidson motorcycles. I used to watch the speed at which Geoff worked and he’s just as quick today, he explained that he never took on apprentices because they’d more than likely arrive on the job complete with three left hands. In the thirty odd years since I last saw Geoff he’d used his exceptional engineering mindset in a number of ways outside of building custom racing frames. First Geoff oversaw the introduction of Trek bicycles into Australia, another collaboration with Tony Cook and Clarence Street Cyclery. 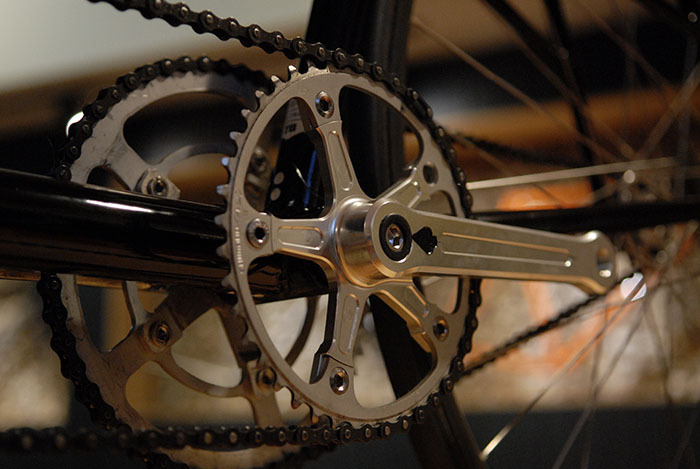 Whenever Trek is mentioned to Geoff, he talks a lot about bottom bracket heights, geometry and something about how he spent most of his time involved with Trek, cutting bottom brackets out of failed frames and sending bags full of them back to the US for analysis. I know what sort of analysis Geoff would give them, [insert multiple profane words here]. After Trek, a system for extracting excess water from oil inside the cooling systems of electrical transformers, saw Geoff travel to remote mining sites within Australia and southeast Asia. Geoff’s invention helped keep transformers running way beyond their usual timeframes. Next, Geoff put his stamp on Australian motorcycle drag racing, his skills with bicycle frame construction and a no bull approach to engineering coming to the fore. Back in the 80’s I remember beer and Harley Davidson’s being a major part of Geoff’s life, his involvement with motorcycles ended when he made the decision about fourteen years ago to quit drinking. I’d spoken to Geoff on the phone about three years ago, he’d been battling cancer and survived, now he’s gone full circle, he rides bicycles almost every day and is back building custom bicycle frames the old way. Steel, lug cuts and instilling every bit of savvy craftsmanship learnt in a lifetime, into every Geoff Scott built frame. Before the 1990’s if you were an amateur cyclist in Australia you got to take home amazing prizes like steak knife sets, sashes and medals. The other alternative was to turn pro, get yourself “in the chop” and race for money. Geoff’s affinity with steel racing bikes began when he was a professional racing cyclist in New South Wales in the 1970’s. In 1979 Bob Hines, a top Australian cyclist of the era commissioned Geoff to build him a road “funny bike” complete with a 24 inch front wheel and rear brake mounted just behind the bottom bracket, now seen on recent Trek bikes! Bob still has this Geoff Scott built funny bike today, probably the first funny bike ever built in Australia. That was when Geoff started building frames, Geoff told me "I was playing around building frames, a very small quantity of frames, for myself and close friends, I wasn't interested in frame building at the time." Then in 1979 Alex Fulcher returned from East Germany with an idea for a new bike frame for the teams pursuit. Geoff was still racing at the time and Alex was Geoff’s coach. Alex’s idea was simple, reduce the total length of four bikes in a line along the track by one third. The concept in motion was four bike riders racing so close together, you’d maximise the potential for drafting and the swing up and back down the bank when riders peeled off after doing a turn on the front, would see them return to the back of the line in less time. Geoff calls it the "caterpillar". With his new frame building challenge, Geoff designed and built four bikes which had smaller 26” front wheels and super short chain stays to reduce the wheel base as much as possible. This was the start of the trend where frame builders began smashing huge indents into seat tubes to reduce chain stay length to the max. The first track funny bikes built by Geoff had the bars and a custom stem brazed onto the top of the fork crown, with a bespoke Geoff Scott head tube cap inserted in the top. Fitting these first Aussie track time trial bikes to riders proved to be difficult every time a different rider saddled up, the handlebar height had to be changed by means of a hacksaw and brazing in newly grafted steel. At the 1982 Commonwealth Games at Chandler velodrome Brisbane, the Aussie team of Gary West, Kevin Nicholls, Michael Grenda and Michael Turtur won gold on Geoff and Alex's sky blue prototype funny bikes. Already in use for a couple of years at world championships, these prototype funny bikes were the product of innovation, built within a project that had no funding. For the January 1984 Australian track championships, Geoff built a special Gefsco track pursuit bike for Russell Tucker. 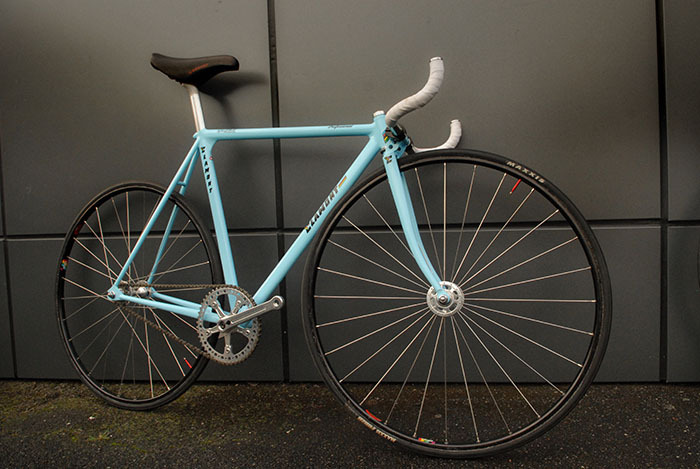 The Russell Tucker bike was built with the second version of Geoff's stem attachment to the fork crown, Geoff said "we decided to come off the centre of the crown instead of the sides, it was a neater design, then we decided to go away from that idea and use a normal drop stem". The image of the Leo Estermann funny bike above shows the style implemented by Geoff Scott, incidentally the Leo Estermann funny bike was brought back to Australia in late 1981 by Russell Tuckers brother, Kenrick Tucker and subsequently used in 1000 metre time trial events by Kenrick. At the Los Angeles Olympic Games in 1984 Australia won the Teams Pursuit gold medal, the riders were Dean Woods, Michael Grenda, Kevin Nichols, and Michael Turtur. Three of the four gold medal winning bikes had a third Gefsco handlebar arrangement which had evolved into the use of a stock handlebar stem. According to Geoff, Dean Woods was riding a Kenevans funny bike at the L.A. Olympic Games. The Australian Cycling Federation, now known as Cycling Australia had no money in the early 1980's, so these bikes existed purely through the generosity of individuals like Geoff Scott and Alex Fulcher. Geoff said, "We had no money in the Cycling Federation, we used a normal stem because bikes were used with different riders in different events. Each rider had their own length stem. The main reason for the use of this stem arrangement was lack of funding. I bludged tubing, Alex Fulcher threw some money into the project, Jim Bundy helped us, TI Reynolds helped us. Everyone pitched in to get it done." After the LA Games Geoff refused to build bikes for Australian teams because of an incident that cut deep, at the selection races for the LA Olympics in 1984. Today Geoff is back building tandems for Australian track teams. Geoff now enjoys building frames for individuals who want to ride an authentic Aussie built bike. Geoff says he's not doing it for the money now, custom bicycle frame building is a passion that keeps him working at something that gives himself and anyone who's ever ridden a Gefsco built bike immense pleasure. Geoff's signature lug cuts include his "royal flush", and you know Geoff builds bikes in a true Aussie style when he tells you that everyone who builds leaves their own special mark, and in Geoff's words "the convict mark". 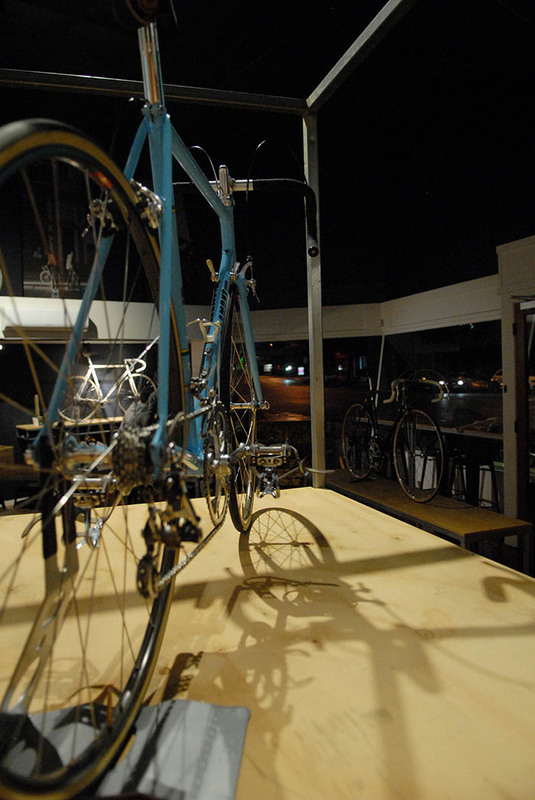 There's no escaping Australia's colonial heritage with a custom frame building concept like Geoff's. It's no wonder Geoff gets hounded by bike collectors in countries like Taiwan, wanting to add a genuine Aussie style bike into their collections. Built with no money and the single minded ambition of individuals, to win on an international stage. 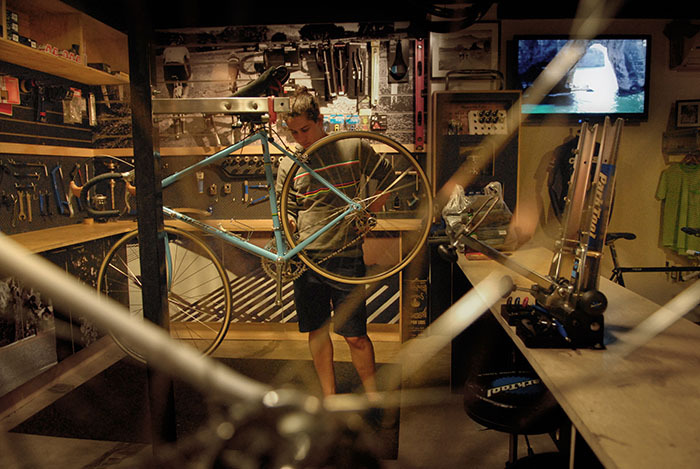 The innovation that came out of Geoff Scott's frame building workshop, helped lay down the foundation for the success that Australian cycling enjoyed in the following decades. Steve from Crankstar prepares the Geoff Scott track pursuit funny bike that Geoff had designed as the first prototype. This version won gold at the 1982 Commonwealth Games held on Chandler velodrome in Brisbane. One of two track bikes that Geoff Scott built for Gary Sutton. Branded as Clamont. Steve from Crankstar prepares Gary Sutton's track bike for the Pushies Galore 2015 evening talk with Geoff Scott, master frame builder. Geoff Scott built this custom 1980's style Australian road bike for the 2015 Pushies Galore show. 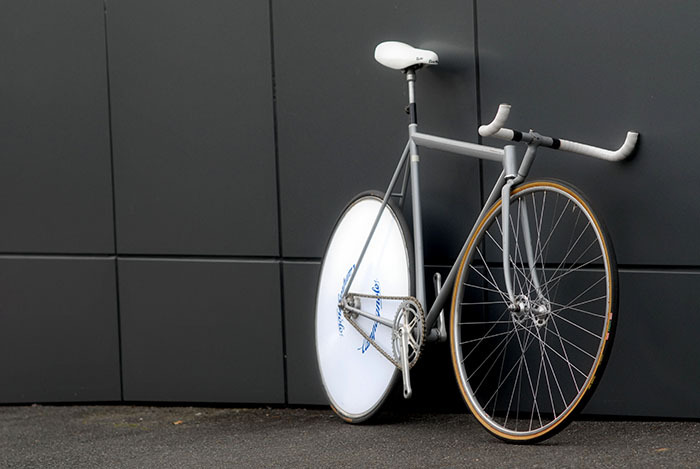 Designed to represent the style of practical road bikes raced by Aussies who couldn't afford the latest and greatest foreign cycling components. Dan "Gypsy"Licastro from Gear Shop West End, helping out with the preparation of Geoff Scott's bikes for the Pushies Galore 2015 evening event. Geoff Scott custom frame builder, in deep thought before his evening chatting to Brisbane Velo Aficionado's. Geoff Scott sporting his Velo Aficionado tee. Geoff's Clamont steel bike representing a 1980's Australian road racing bike, complete with a spare single slung underneath the ever popular Selle Italia Turbo saddle. Distinctive drilled lugs by Geoff Scott, my first Gefsco bike had the same style of drilled lugs. Three of Geoff Scott's favourite bikes lined up. Ready for Brisbane's bike enthusiasts to view at Crankstar, the 1982 gold medal winning Commonwealth Games funny bike by Geoff Scott. Geoff's practical road bike was a hit. Brand new 1980's style in 2015. Another bike that Geoff Scott searched for, it was found in Brisbane, Peter Day had it stashed away at Chandler Velodrome. Russell and Byron Tucker's tandem that Geoff had built for them in the early 1980's. Gefsco pantographing. Classic Gefsco work bearing the mark of the "convict". Geoff Scott talking to Peter McClennan, bike collector and long term bike addict. It wasn't all about Geoff at Pushies Galore 2015, Ben Kemenjas from Cicli Spirito and Adam Leddin from Cycle Exif shared the lounge. Here Geoff gives his opinion about Gary Sutton's track bike.